Showcasing the state of our science from across the SRS over the past year. This badge denotes that the item is one of five highlights selected by the Station Director for commendable achievement. The Southern Research Station provides science that helps managers and landowners create resilient forest communities and ecosystems. We work to anticipate and mitigate forest threats such as insects, diseases, climate change, and fire. Our science analyzes and describes changes in environmental and socioeconomic conditions that impact land use decisions. Why are we using prescribed fire in upland hardwoods? SRS delivers the knowledge, tools, and technologies needed to sustain healthy watersheds, ecosystems, and the services they provide to millions of people in the South. Our science informs policy decisions that contribute socioeconomic benefits to local communities, southern states, the region, and the nation. SRS research contributes to basic scientific knowledge and translates this science into practical applications. Our research is innovative and collaborative, reaching across geographic scales to address multidisciplinary, socioeconomic, and ecological challenges. Our science contributes to national and global understanding of resilient forest ecosystems and adaptive forest management. Southern forests are home to some of the most diverse ecosystems in North America. They’re also vital to the U.S. timber economy – almost a third of the nation’s forested lands and net annual timber volume growth are found in the 13 southern states. SRS research is focused on delivering scientific products and tools that address the diverse needs of our stakeholders and partners. The 2017 Research Highlights gallery showcases the state of the science from across the SRS over the past year. The Research Highlights are organized by three of the strategic goals that guide our agency’s research programs: Sustain Our Nation’s Forests and Grasslands, Deliver Benefits to the Public, and Apply Knowledge Globally. Scroll down to find updates on our forest inventory and monitoring, forest threats, forest values, forest watershed science, and forest restoration and management research. Each summary includes new publications, contact information, and resources to learn more. Keep up with current news about SRS research by following us on Twitter at @usfs_srs! 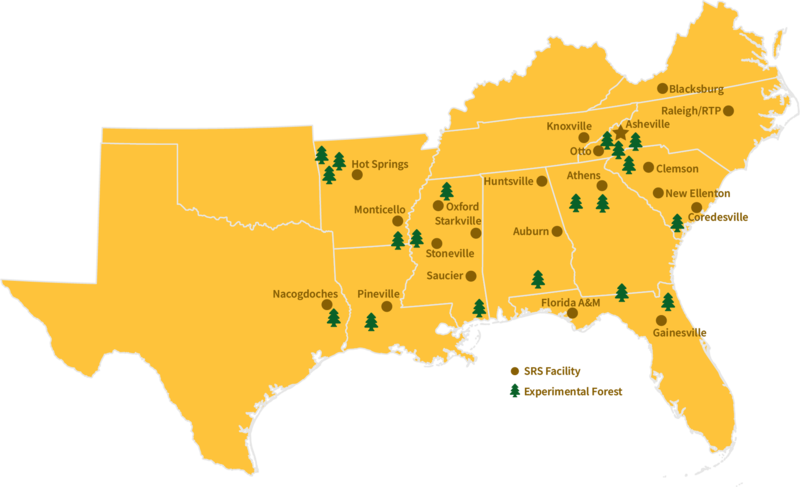 Map of Southeastern United States showing Southern Research Station facility and experimental forest locations. Open a larger version of this map in a new window.